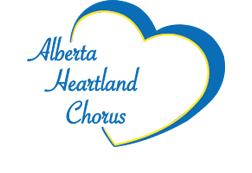 Alberta Heartland Chorus is a chapter of Sweet Adelines International, a highly respected worldwide organization of women singers committed to advancing the musical art form of barbershop harmony through performance, education and competition. This independent, nonprofit music education association is one of the world's largest singing organizations for women. Alberta Heartland Chorus enjoys performing for our community. We sing at a number of local events, such as the Canadian Derby (pictured above), compete in an annual competition and have a show every other year. We are available to sing at your next function or event. If you're looking for a unique musical experience to liven up your event, please check out our "Experience Us" section. In addition to sharing our music with others, another great passion of ours is learning more about the art of a cappella singing. Vocal instruction is a regular part of chorus rehearsals and a very important component of the chorus experience. A few times each year, we receive coaching from a visiting master in the art of barbershop, where we learn many fabulous tricks of the trade.